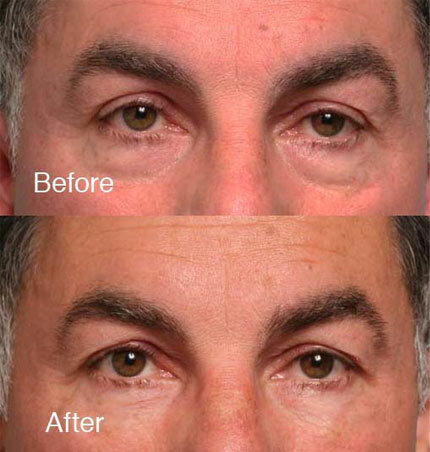 Click here to learn more on dark circles treatment in Beverly Hills to treat puffy bags under the eyes. 40 year old woman who is bothered by the deep circles under the eyes. Treatment: After a through consultation with Dr. Steinsapir, she choose a DeepfillTM undereye Restylane® treatment, and a Microdroplet Lift® cosmetic botulinum toxin A forehead lift. Notice the lift along the eyebrows. 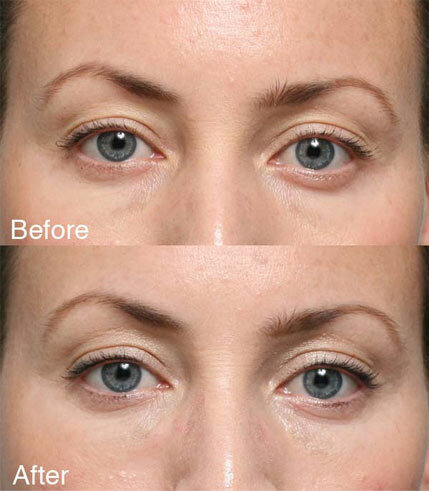 The undereye circles have been enormously improved by the Restylane® treatment. This results easily rivals what can be accomplished by surgery. 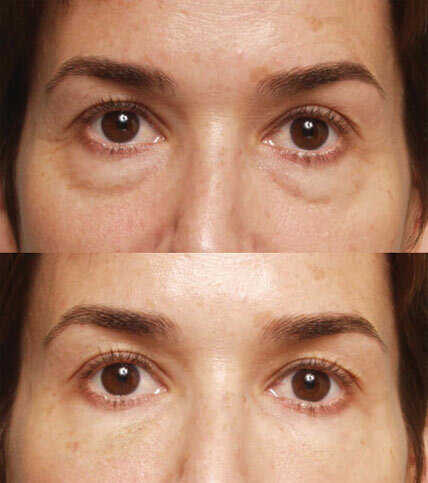 The under eye area is enormously benefited by treatment with the Hyaluronic acid filler. 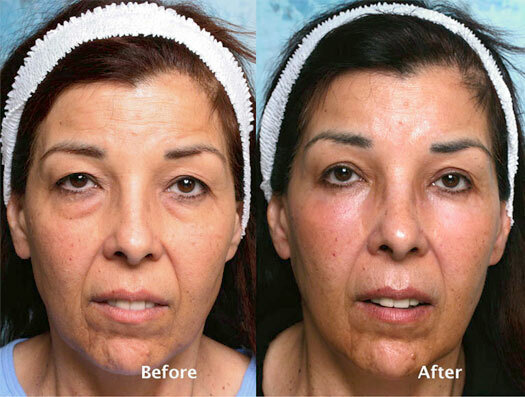 The filler result rivals what can be accomplished with surgery with no down time. 36-year old woman who concerned that here eyes make her look tired. 48 year-old with under eye circles. Under eye Restylane with Deepfill method. Herniated lower eyelid orbital fat. 1. Restylane Deep Fill Treatment. 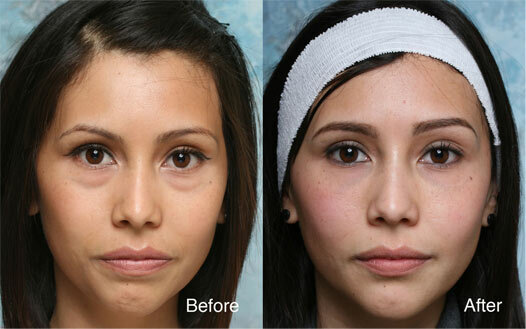 Note that she had 2 ml of under eye Restylane. The after photograph was taken 2 years after the original service! These are results that rival what can be accomplished with surgery. 54-year old woman who feels her appearance makes her look tired. She wants to refresh her appearance but wants the results to look very natural. Hooding of the upper eyelids. Full lower eyelids due to herniation of the orbital fat. Bilateral upper eyelid anchor blepharoplasty. Bilateral lower eyelid transconjunctival blepharoplasty. Bilateral lower eyelid chemical peel. 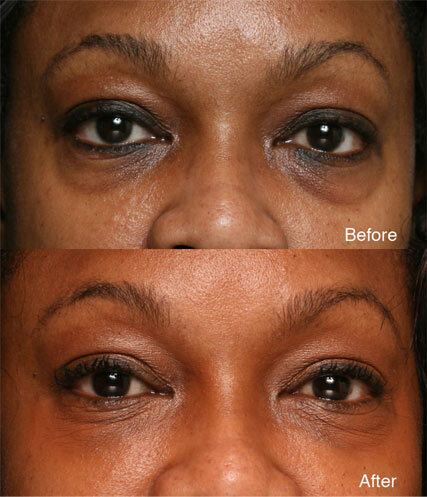 In this instance, a very detailed approach was needed to comprehensively improve her eyelid area. Pushing a single approach too far causes an over-operated appearance. Her appearance is very natural because of the detailed problem oriented approach to addressing her aesthetic concerns. Dr. Steinsapir of LidLift and his staff will also discuss with you prior to surgery what you need for your recovery. This is very important. For those who are coming from out of town, they may need a night nurse for one or two nights or in some cases, a recovery facility may be recommended. For those traveling with loved one’s, in most cases, your family member can serve as your night nurse. For individuals who live in the area, they have the option of recovering at home, but in some cases it may make sense to stay within a short distance of the office for the first night or two. These are details that will be discussed with you based on your circumstances and the exact nature of the surgery that is planned.